Only 34-days until the 50th Minnesota Ironman Bike Ride. are your registered? 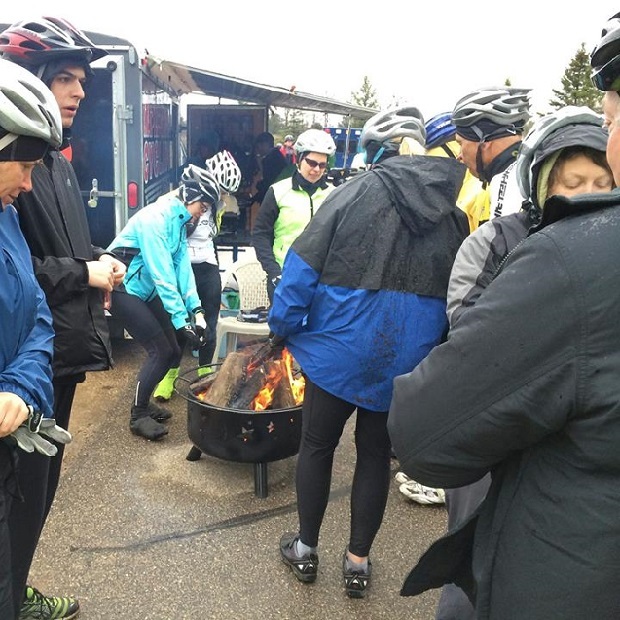 Here in this photo Ironman bike riders, regardless of cold or warm temperatures, enjoy gathering around the fire pit at the designated rest stops to catch-up with old and new friends – And we bet some riders will be polishing their bragging statement before finishing the ride! 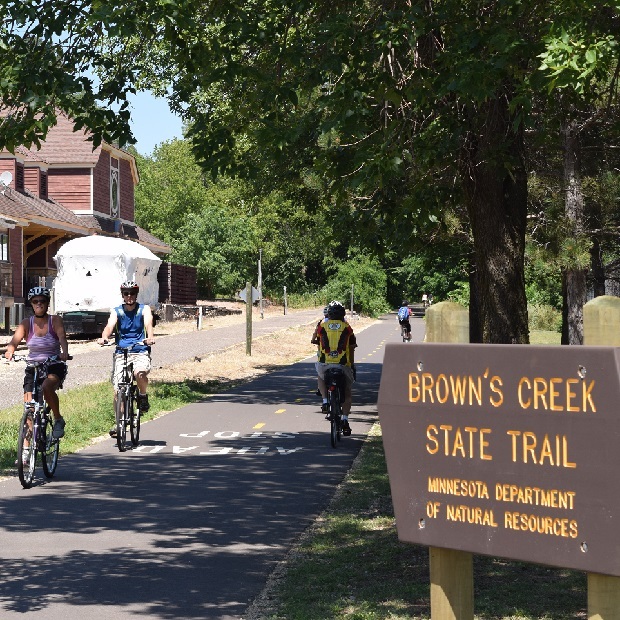 This entry was posted in News and tagged #FindYourNextAdventure, #onlyinMN, bike Stillwater, bike Washington County, Browns creek trail, Discover Stillwater, Gateway trail, Minnesota Ironman Bike Ride, MN Bike Events, Spring bike event on March 21, 2016 by Russ Lowthian. Only 41-days until the 50th Minnesota Ironman Bike Ride and here is your chance to extend your time in the scenic St. Croix River Valley with a special lodging package. Discover Stillwater has just announced some special lodging opportunities for those participating in this years ride. While available, you can explore the area over the weekend and start your Sunday morning bike ride earlier and more relaxed. 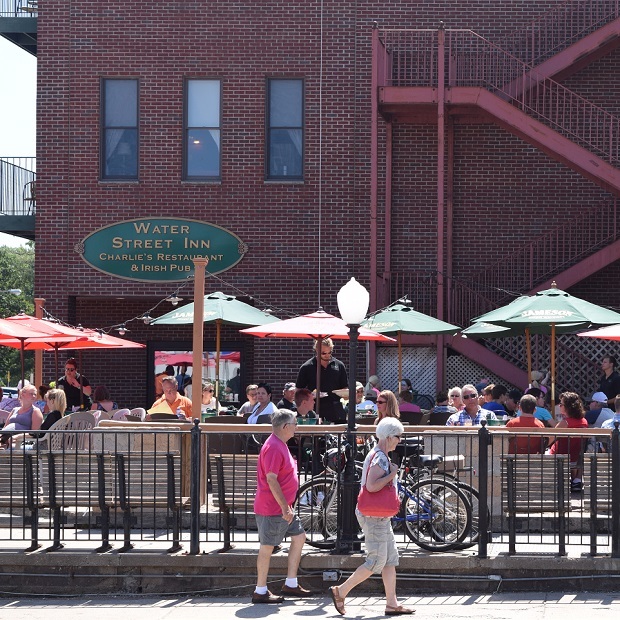 Stillwater’s historic district is a culinary escape with over 30 independently owned restaurants and pubs along with boutiques, specialty shops, art galleries, and vintage finds. Discover Stillwater… the 1848 Birthplace of Minnesota is a place where paddle wheel riverboats and gondolas glide the waters. Historic Main Street shopping, dining, lodging and entertainment are yours inside this charming river town. 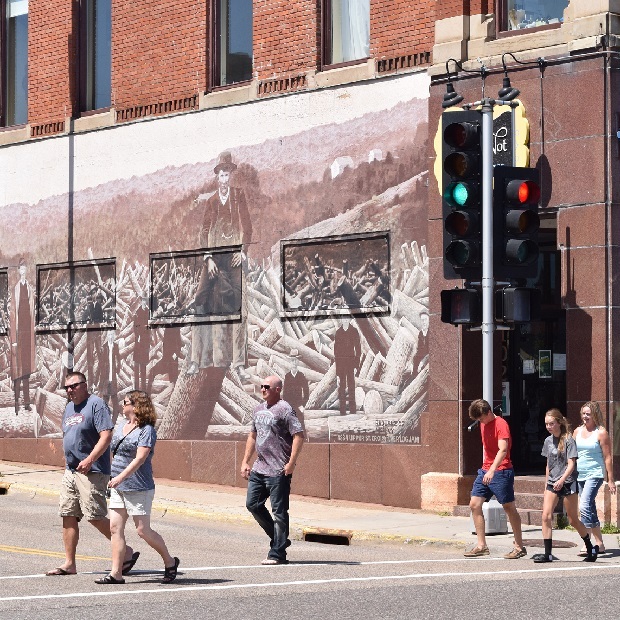 Plus, you will find, year-round there are so many things to do in Stillwater, Minnesota! Enjoy all four seasons in Stillwater: Spring flowers blooming in the parks and along the bike trail; Warm summer air welcoming outdoor art fairs, restaurant patios, festival events, boating, and historic sightseeing; The robust colors of the bluffs in the Fall and crisp flavors of winery and brewery harvests; and winter days showcasing holiday boutique shopping, romantic winter escapes or vintage/antique shop browsing. Yes, Welcome to beautiful Stillwater minutes from the Twin Cities Minneapolis and St. Paul and just over the Lift Bridge from Wisconsin. Their bed and breakfasts, historic inns and many Stillwater hotels await your visit – A place you’ll want to come back again and again, to the place where it all began. Stillwater, Minnesota has been voted as: America’s Most Picturesque Small Towns; Best American Towns for Fall Colors; Best U.S. Towns for Antiquing; Best Twin Cities Day Trips; Best Minnesota Weekend Getaway; America’s Prettiest Painted Places, and the Most Romantic City. 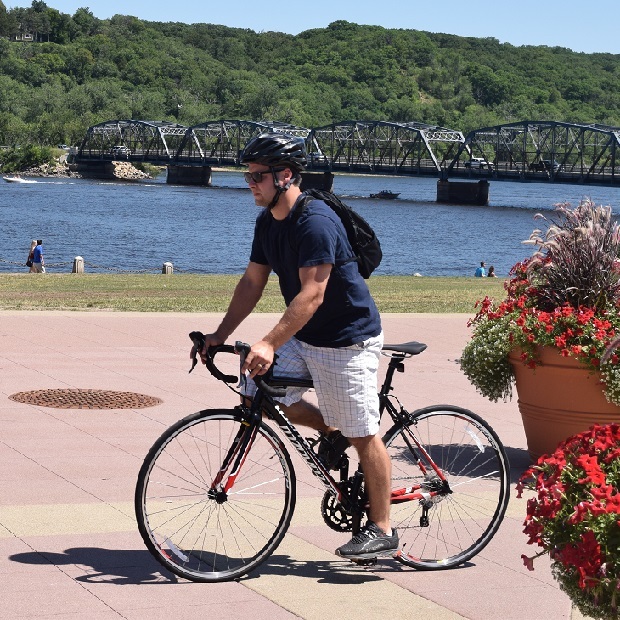 Plan your perfect Midwest bike getaway, romantic escape, corporate retreat or vacation in beautiful Stillwater, Minnesota! Enjoy your time in one of America’s Most Picturesque Small Towns (USA Today Travel, 2015) and Minnesota’s Birthplace. Not matter what style of a bike you ride or your riding ability, the 50th Anniversary of the Minnesota Ironman Bicycle Ride is a great way to begin the 2016 summer riding season. Register by April 1st (no fool’n) and save! Since its beginning in ’67 the Minnesota Ironman has been run by Hostelling International USA. A non-profit charitable organization devoted to promoting healthy recreation, international travel and cultural exchange. You can find out more about this organization at their web site: www.hiusa.org. This entry was posted in News and tagged #FindYourNextAdventure, #onlyinMN, bike Stillwater, bike Washington County, Browns creek trail, Discover Stillwater, Gateway trail, Minnesota Ironman Bike Ride, MN Bike Events, Spring bike event on March 14, 2016 by Russ Lowthian. 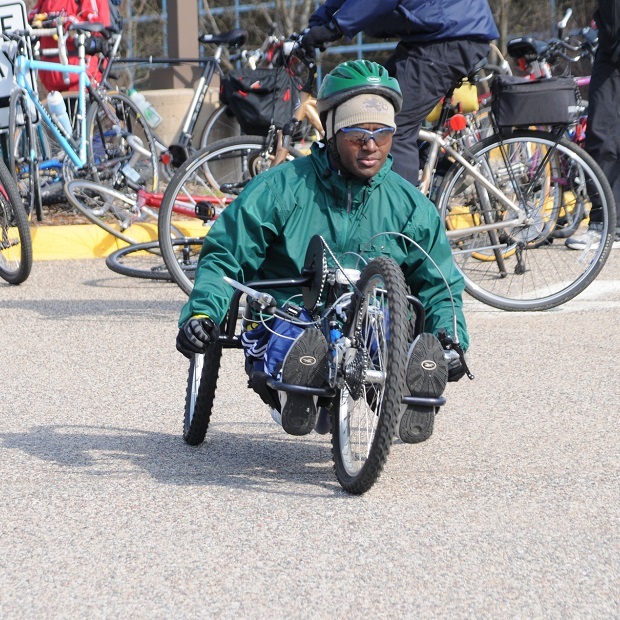 Bike Pic March 7, a spring ride for all abilities! Not matter what style of a bike you ride or your riding ability, the 50th Anniversary of the Minnesota Ironman Bicycle Ride is a great way to begin the 2016 summer riding season. 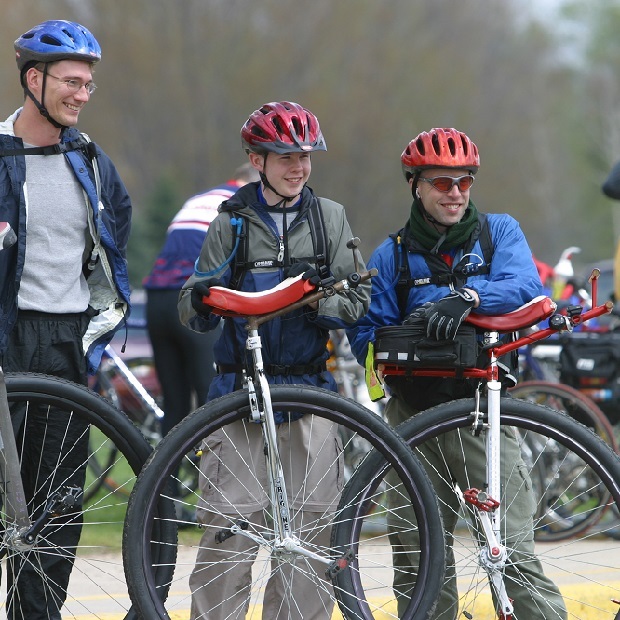 Warm or cold weather many from the Twin Cities Unicycle Club have already preregistered, will you? 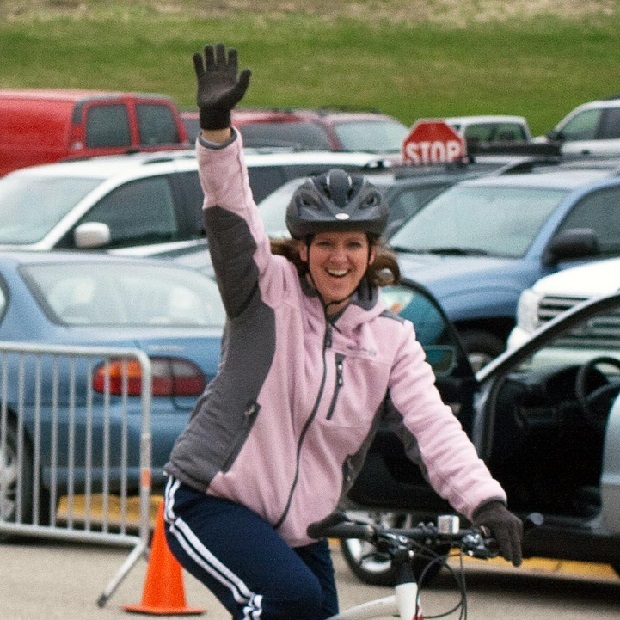 Here is one excited lady on her bike and waving after hearing the news about the 2016 Minnesota Ironman’s registration opening. 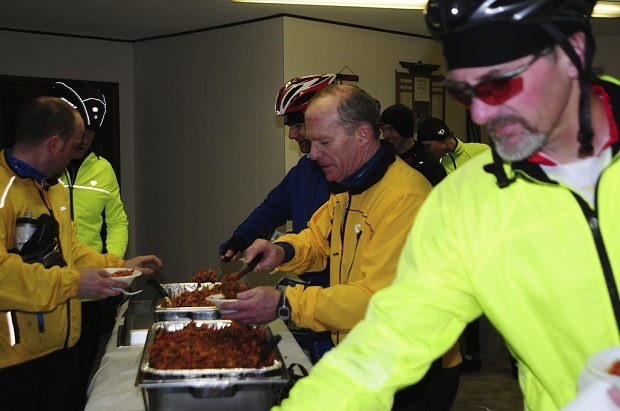 This entry was posted in News and tagged #FindYourNextAdventure, #onlyinMN, bike Stillwater, bike Washington County, Erick's Bike Sponsor, Gateway trail, Minnesota Ironman Bike Ride, MN Bike Events, Park Tool Sponsor, Penn Cycle Sponsor, Spring bike event on March 7, 2016 by Russ Lowthian. As the bike photo above shows, time is ticking and there are only 52 days left until the 50th Minnesota Ironman Bike Ride. With the theme of the ride ‘no running or swimming involved’ this years annual event, on April 24th, in Stillwater, offers several new route options for both the novice and season cyclist. And, since the rides beginning in 1967, you always have bragging rights at the end of each spring-time bicycling adventure. The Minnesota Ironman® Bicycle Ride (MIBR) is just that, a bike tour not a race. Not to be confused with the IRONMAN Triathlon, the MIBR is a biking only, with no swimming or running involved and is open to riders of all ages and abilities. 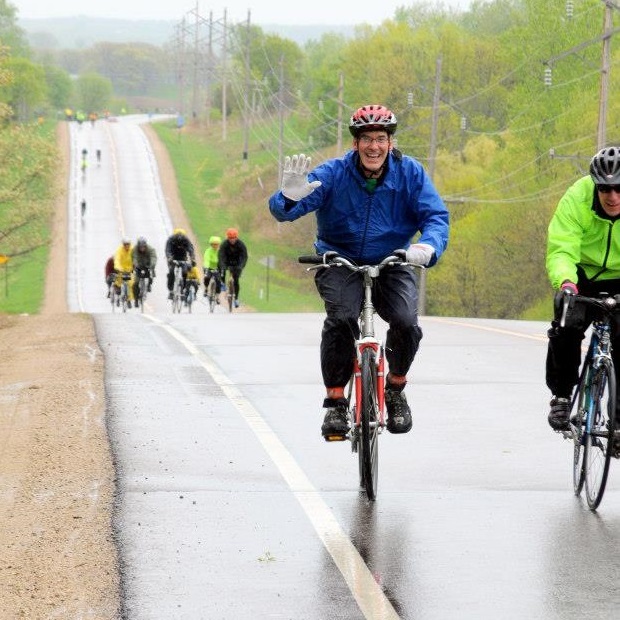 Join thousands of the heartiest cyclists around the upper Midwest for this benchmark event held near Stillwater, Minnesota, in the scenic St. Croix River Valley. Routes have been designed offering a 15, 30 and 60-mile loop options to provide everyone, from casual riders to the experienced cyclists a choice. 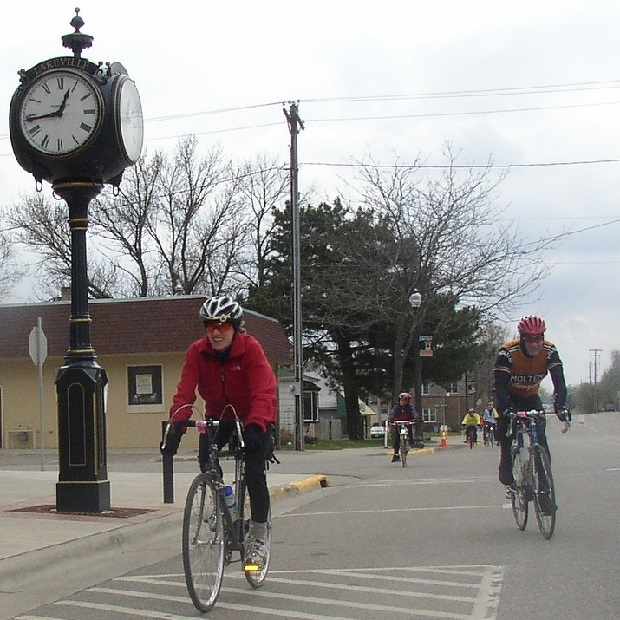 Whether a shorter loop is desired or a combination of several loops to make a century ride, its a fun to kick off the cycling season at this event. Plus, as the earliest recreational tour in the Upper Midwest, the Minnesota Ironman® continues to guarantee bragging rights. The Minnesota Ironman® Bicycle Ride, was established in 1967 and is the longest running bike ride in Minnesota, with century options. Well over 100,000 cyclists to date have biked the MIBR over the years. Along the official Ironman routes, each year, participants find well stocked rest stops to help everyone stay hydrated and nourished throughout the ride. Here John Morast and Kathy Johnson are ready for the 50th MN Ironman Bike Ride. The question is will their favorite mascot be joining them? Early Bird Registration is open at www.IronmanBikeRide.org, offering a discount on registration from day-of fees. This entry was posted in News and tagged #FindYourNextAdventure, #onlyinMN, bike Stillwater, bike Washington County, Erick's Bike Sponsor, Gateway trail, Minnesota Ironman Bike Ride, MN Bike Events, Park Tool Sponsor, Penn Cycle Sponsor, Spring bike event on March 2, 2016 by Russ Lowthian. Register today (February 29th) for the best MN Ironman Bike Ride rate for the 50th Anniversary Ride and save. Join the 1,200-plus riders who have already registered for the fun and bragging rights riding, in the spring, in the beautiful St. Croix River Valley in Stillwater, MN, on April 24th. 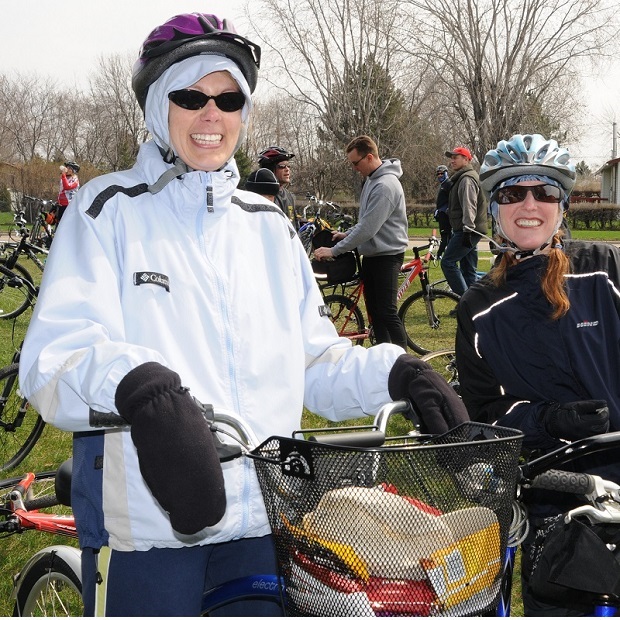 Regardless, if the weather is warm or cold weather riders have a lot of fun as the ladies in the photo demonstrate. For many riders the MN Ironman is an annual spring tradition. Their routes are challenging, weather unpredictable, but the ride attracts thousands and is always an challenge worth participating in and bragging about. Sign up today and prepare for an adventure of a lifetime. This entry was posted in News and tagged #FindYourNextAdventure, #onlyinMN, bike Stillwater, bike Washington County, Erick's Bike Sponsor, Gateway trail, Minnesota Ironman Bike Ride, MN Bike Events, Park Tool Sponsor, Penn Cycle Sponsor, Spring bike event on February 29, 2016 by Russ Lowthian. 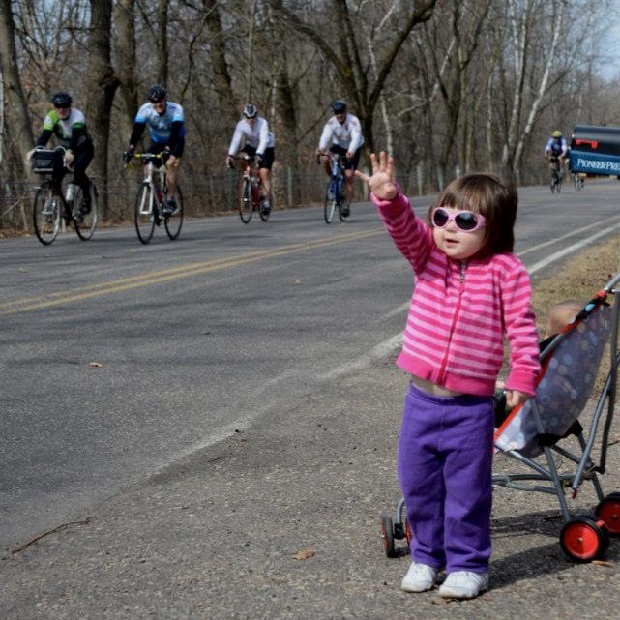 With 62 days until the 50th Anniversary on the Minnesota Ironman Bike Ride, here in the photo above, is a future Ironman participant waving as a group of cyclists go by. This is the upper Midwest’s first major organized bike ride of the season and is a great family fun event that requires no running or swimming – Just riding a bike on one of several scenic St. Croix River Valley routes, starting in Stillwater, MN. Now, rolling into our 10th year as a bike tourism media our goal is to continue to encourage more people to bike, while showcasing unforgettable places to ride. As HFB searches and present more fun bike related photos worth a grin, scroll through the information and stories we have posted to help you find your next adventure. Then, while out there if you see us along a paved or mountain bike trail, next to the route you regularly commute by bike on, or at an event you plan to attend with your bike, be prepared to smile. You never know where our camera’s will be and what we will post next! Do you have a fun bike related photo of yourself or someone you know that you would like to see us publish? If so, please send it our way and we may use it. Send your picture(s) to editor@HaveFunBiking.com with a brief caption (of each), including who is in the photo (if you know?) and where it was taken. Photo(s) should be at least 620 pixels wide for us to cinsider using them. If we do use your photo, you will receive photo credit and an acknowledgment on Facebook and Instagram. As HaveFunBiking continues to encourage more people to ride, please reference our blog and the annual print and quarterly digital Minnesota Bike/Hike Guide to find your next adventure. We are proud of the updated – At-a-Glance information and maps we are known for at the HFB Destination section on our website and in the guide. Now, as the Bike/Hike Guide goes into its seventh year of production, we are adding a whole new dimension of bicycle tourism information available for mobile devices where you may see some additional bike pics – maybe of yourself. This entry was posted in News and tagged #FindYourNextAdventure, #onlyinMN, bike Stillwater, bike Washington County, Erick's Bike Sponsor, Gateway trail, Minnesota Ironman Bike Ride, MN Bike Events, Park Tool Sponsor, Penn Cycle Sponsor, Spring bike event on February 22, 2016 by Russ Lowthian. In 69-days, Ben Wilson and his friends will be riding bike enjoying the first ride of the season – the 50th Anniversary on the Minnesota Ironman Bicycle Ride. With no running or swimming required, this annual bike ride offers several scenic St. Croix River Valley routes starting in Stillwater, MN. Register today and save! This entry was posted in News and tagged #FindYourNextAdventure, #onlyinMN, bike Stillwater, bike Washington County, Erick's Bike Sponsor, Gateway trail, Minnesota Ironman Bike Ride, MN Bike Events, Park Tool Sponsor, Penn Cycle Sponsor, Spring bike event on February 15, 2016 by Russ Lowthian.